Growing concern over greenhouse gas emissions associated with energy production from the combustion of fossil fuels has prompted a proliferation of renewable-energy production in the United States and abroad. Despite the environmental benefits associated with renewable-energy development, recent work highlights potential negative impacts on wildlife and the environment. A largely unanticipated impact of utility-scale wind-energy development has been widespread mortality of bats. Survey data suggest mortality rates of up to 70 bats per turbine per year in North America with the highest rates along forested ridgelines of the central Appalachian Mountains. The population-level impacts of bat mortality from wind-energy development are currently unclear and the life history characteristics (e.g. long-lives, low fecundity, and migratory patterns) of bats may make it difficult for their populations to recover from sustained mortality. Understanding the impacts of turbine mortality on bats requires detailed information on their population biology where turbine development is occurring, such as migration pathways and geographic extent of regional habitat use, and the genetic diversity and demographic history of populations. In this project we combined application of stable hydrogen isotope and population genetic analyses to assess the biological impacts of wind-energy development on two species of Lasiurine bats, L. cinereus (hoary bat) and L. borealis (eastern red bat), which collectively comprise nearly 75% of mortalities at wind-energy facilities in North America. We used stable hydrogen isotopes (δ2H) as a tool to infer the potential summering regions of individuals of unknown geographic origin that were killed at turbine sites. We also performed population genetic analyses to better understand how the genetic diversity and population structure of impacted bat species may affect the resiliency of populations to sustained mortality, as well as their capacity for long-term adaptation. Is turbine mortality impacting bats that are summering locally or individuals from a broader geographic area? What is the effective size and temporal stability of bat populations experiencing mortality and do these populations exhibit subpopulation structure? Hair and tissue samples from hoary (n=246) and red (n=144) bats were obtained from carcasses collected at wind-energy facilities (left) in the central Appalachian Mountains between April and October in 2003 and 2009-2011. We measured δ2H values of non-exchangeable hydrogen in hair keratin and converted these values to δ2H values of precipitation to generate likelihood-of-origin maps for each bat using IsoMAP (http://www.isomap.org). Total genomic DNA was extracted from wing punches and then amplified. Subsequent analyses allowed us to test for the presence of more than one genetic subpopulation and to model the historical demography and effective population sizes for each species. Likelihood-of-origin maps generated from stable isotope data, allowed us to infer whether bats killed at wind-energy facilities spent their summers near or far from where they were killed (below). About 1% of hoary bat mortalities and about 57% of red bat mortalities derived from non-local sources. The variation in likelihood of local origin for these species may indicate differences in migratory pathways or corridors that they use when traveling to their summering and wintering grounds. Results suggest that mortality caused by wind-energy development affects red bats from across a broad area while the bulk of hoary bat mortality appears to be composed of local bats originating near the site of mortality. Overall, these results suggest that a given wind-energy facility may impact bats originating across a broad geographical extent. We observed a lack of genetic structure in our data, which suggests that wind-turbine mortality in the central Appalachians is affecting randomly mating populations of hoary and red bats. This lack of structure suggests high historical gene flow and also that the potential genetic impacts of turbine-associated mortality (e.g., reduced genetic diversity) will largely affect the breeding population as a whole rather than disproportionately affecting specific subpopulations of each species. Hoary bats had a small effective population size and either a stable or declining history. In contrast, the diversity encountered in our red bat samples is consistent with a much larger size that reflects a demographic expansion after a bottleneck. These results suggest that the impacts of mortality associated with intensive wind-energy development may affect bat species dissimilarly, with red bats potentially being better able to absorb sustained mortality than hoary bats in the central Appalachians due to their larger effective population size. Our study focused on bats killed at utility-scale wind-energy facilities in eastern North America. However, the expansion of wind energy and the potential long-term impacts to bat populations is a global issue. Studies such as ours can help to identify species or even subpopulations at particular risk to wind-turbine mortality. Representative likelihood-of-origin maps like the two shown below for two different hoary bats were generated for each individual sampled. Red areas indicate the highest likelihood of origin for each particular individual while blue areas indicate lowest likelihood of origin. The map for the individual shown on the left suggests that the bat was local, which is indicated by the red at the sampling locations. The individual pictured in the map on the right was most likely to have summered elsewhere, which is suggested by the red bands located further north and the blue areas at the sampling locations. Shown below are three different output plots from STRUCTURE, which was used to analyze the population structure from the genetics results. 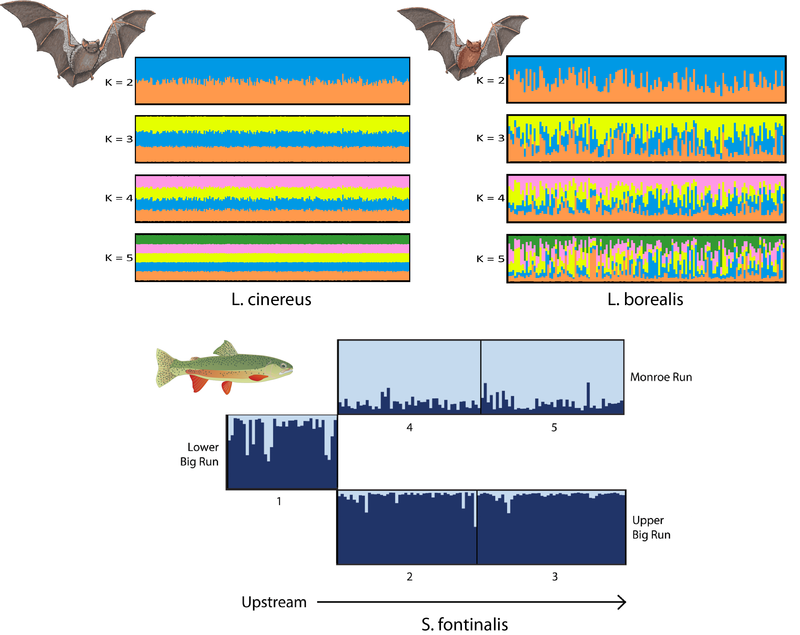 The top two diagrams depict the genetic structure of the different bat species from this study (L. cinereus and L. borealis). Each individual is represented by a single vertical line. The results from the bat work suggest that there are no distinct genetic populations among the two bat species. Conversely, the bottom diagram depicts the genetic structure of a population of brook trout (Salvelinus fontinalis) sampled in western Maryland that does have genetic structure (Kazyak et. al 2016). Our results provide a much-needed baseline for future monitoring and research. Although our existing work has been limited to the central Appalachians, bats face threats throughout their ranges. Thus, many additional questions remain to be answered regarding the impacts and sustainability of the mortality of bats at wind-energy facilities throughout North America and the world. Appalachian Lab scientists are at the forefront of research in this area.